Woburn, MA – November 6, 2018 — /BackupReview.info/ — Today, Kaspersky Lab is announcing the availability of its Spam and Phishing in Q3 2018 report, which found that the company’s anti-phishing system prevented more than 137,382,124 attempts to visit fraudulent web pages. This amount continues the trend in fast growth of phishing attacks seen quarter over quarter in 2018. 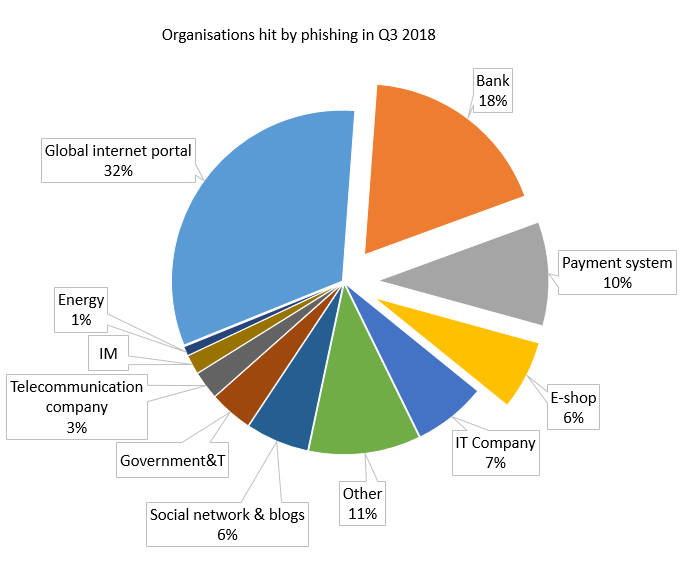 With the continual increase in phishing attacks this year, in the third quarter, the number of phishing attempts exceed the amount in Q2 (107,785,069) by 27.5 percent. During the quarter, the financial segment was hit especially hard with more than a third of all the phishing attacks aimed at banks, payment systems and e-commerce organizations. This activity also proves further development of a trend Kaspersky Lab experts found in Q2, in which the figure was over 20 percent. The country with the highest percentage of users attacked in Q3 was Guatemala with almost 19 percent, surpassing the leader of a previous quarter – Brazil. This country saw the second highest percentage of users attacked with 18.6 percent. The third place was taken by Spain, with 17.5 percent of users subjected to phishing attacks. Always check the link address and if the sender’s email is genuine before clicking anything. Even more, do not click the link, but type it into the browser’s address line instead to be sure that the name of link in the message doesn’t cover another hyperlink. If you are not sure that the website/sender is real and safe, do not enter your credentials, and if you think you may have entered your login and password on a fake page, immediately change your password. Only use a secure connection – especially when you visit sensitive websites. In addition, do not use unknown or public Wi-Fi without password protection. For maximum protection, use VPN solutions that encrypt your traffic, such as Kaspersky Secure Connection. If you are using an insecure connection, cybercriminals can unnoticeably redirect you to phishing pages. Use a proper security solution with behavior-based anti-phishing technologies, such as Kaspersky Security Cloud and Kaspersky Total Security, which will warn you and protect you if you are attempting to visit a phishing web page.